Vous souhaitez poser une question à l'établissement Lake Scene Resort ? 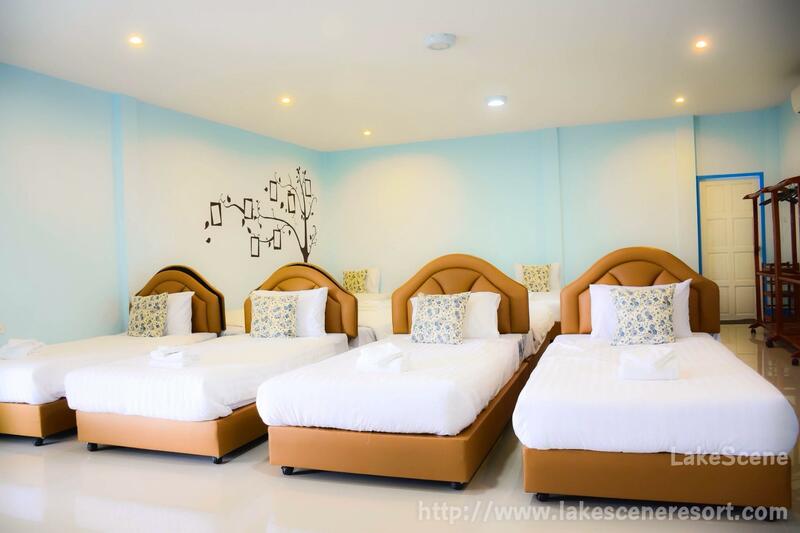 Durant votre séjour à Ratchaburi, vous vous sentirez parfaitement bien au Lake Scene Resort, dont les chambres et le service sont d'une qualité hors pair. L'hôtel se trouve à 20 km du centre-ville et permet d'accéder aux infrastructures urbaines les plus importantes. Grâce à son excellente situation, l'hôtel permet de se rendre facilement sur les sites incontournables de la ville. Profitez d'une multiplicité de services et d'équipements incomparables dans cet établissement de Ratchaburi. Pour le confort de ses clients, cet établissement propose WiFi gratuit dans toutes les chambres, cuisine, réception 24h/24, check-in/-out express, WiFi dans les espaces communs. Toutes les chambres ont été conçues pour le plus grand confort des hôtes. La plupart d'entre elles disposent même d'une gamme d'équipements tels que télévision écran plat, SdB supplémentaire, portant pour vêtements, café instantané gratuit, miroir, et bien plus encore, qui satisferont les clients les plus exigeants. L'hôtel propose des équipements fantastiques, comprenant entre autres fléchettes, piscine extérieure, pêche, aire de jeux pour enfants, piscine pour enfants, pensés pour que vous puissiez vous détendre après une journée harassante en ville. 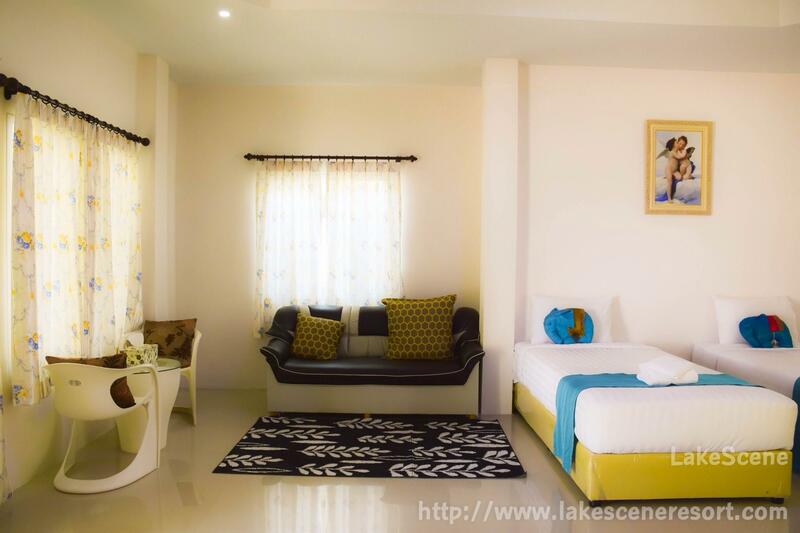 Services hors pair et adresse prestigieuse sont le lot du Lake Scene Resort. the hotel is very nice and clean. The location is a bit far from the city of Ratchaburi though. It's close to a beautiful lake with a nice sunset view. The facility is with a swimming not so big though. Bicyles and ATV are also available. 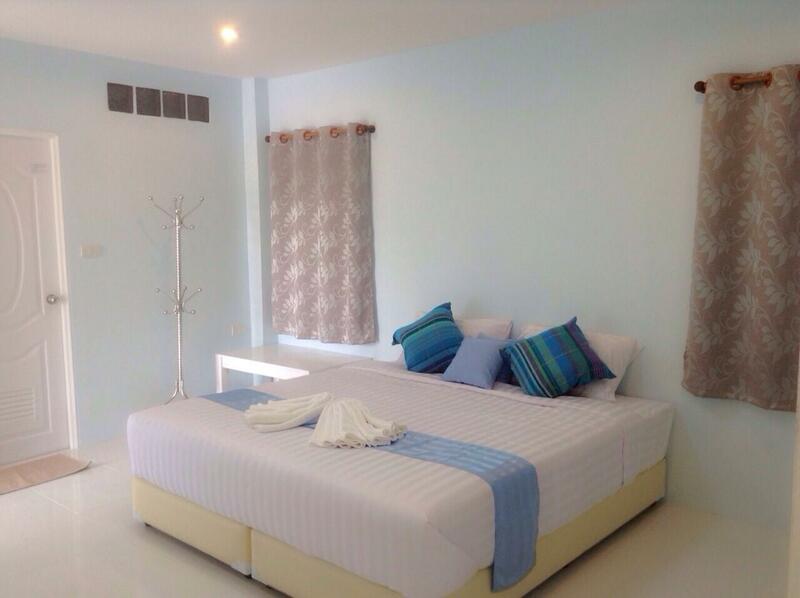 Great place for staying near Khao Pratab Chang. The 5-bed-room was a little camp, to say the least. All pink, flowery scent... But good for a night or two. My friend and I booked two rooms in this hotel for a race in the area. This hotel was pretty basic and suited our needs- a place to sleep with a shower. The next day there was a basic breakfast provided until noon (since the race was in the morning) and then we had a leisurely swim. The pool was okay if there are not many people there. I would probably stay here again if I went to another race in the area. The twin room is quite big and clean. Good location for chombueng marathon. Breakfast is available till noon for people joining the race. Staffs are good and helpful. The location isn't bad and there's a nice view on a lake (pond) if you climb on a terrace near the swimming pool. However, it's far from the main attractions and there are no restaurants around. The swimming pool was dirty (it was only leaves but it doesn't take that long to make it presentable). We stayed two night and no one cleaned the room after the first night. The breakfast was just acceptable. Overall the complex looks nice and there is space for the kids to play but at that price I can find much better alternatives elsewhere. I won't go back! We paid almost 4,000 baht for this crummy room worth about 800 only. Staff would not prepare an alternate to go meal when we could not stay for their breakfast. Lighting in the bug ridden room was inadequate and funny colored. Drove by car, and found the resort without issue. Unlike many countryside locations, the map for this was spot on. Staff were extra helpful right from the start; giving us advice on where to eat, helping with lots of little things. Much more than I am used to. Most impressed. 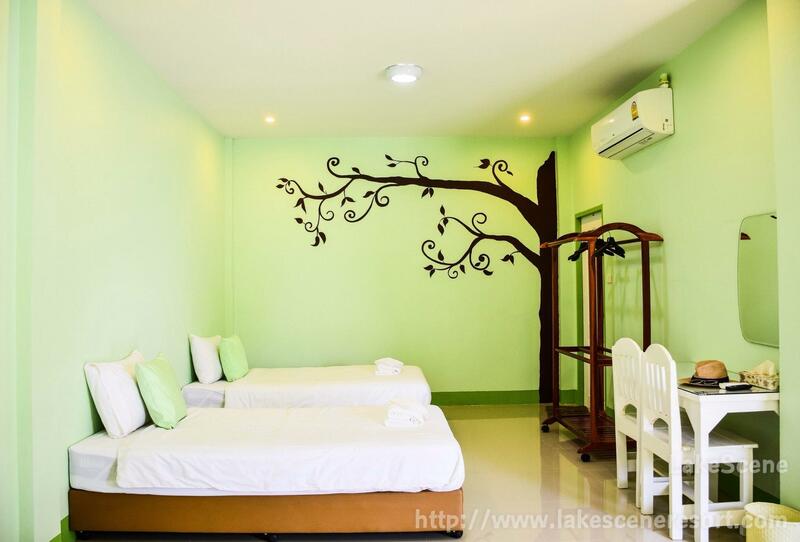 Rooms are modern and clean, set in lovely grounds with wonderful trees and flowers (all named), and garden decorations. Nothing was run down, and all looked as good as the photos. If I had one complaint, it was probably that the price was a little higher than the room itself was worth. Given the performance of the staff however, at the end of the stay I really didn't mind. 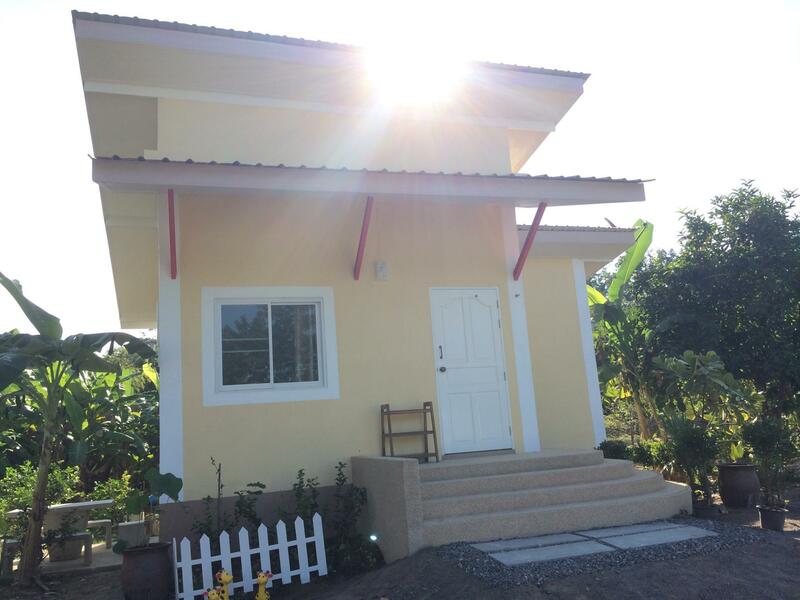 If you are looking for a quiet countryside retreat, in a beautiful part of Thailand, you could much worse. Recommended. Good beds, easy check-in, check-out and access to hotel. Check-in and access to room was very fast. Beds were really good. Friendly staff, and provided water heater for early morning coffee, as it was not available in room. But there is no restaurant at the hotel, and the nearby recommended restaurant closed already at 19:30. So we had to drive 15km to the nearest restaurant at ChomBueng. They seems to have breakfast, but no dinner at all (although they can order from outside if request it early). Swimming Pool was very small and a bit dangerous for kids playing, as invisible concrete/tile edges (underwater) separated the kids pool and adults pool, making risk of sliding of injury, if jumping into the pool. You need your own transport to enjoy this area. The hotel was fine, new and clean but we paid more than I realised when booking so I found it to be expensive. It is not really a resort as there is no restaurant on site and things feel a little unfinished. But the owner is very helpful and eager to please. We enjoyed it here. Our stay was enjoyabel, however, looking back I found the hotel to be expensive for what it is. Borrow the bikes to cycle to or round the lake and eat breakfast on the roof. No restaurant - again a shame - but plenty of little restaurants nearby if you can speak a little Thai.